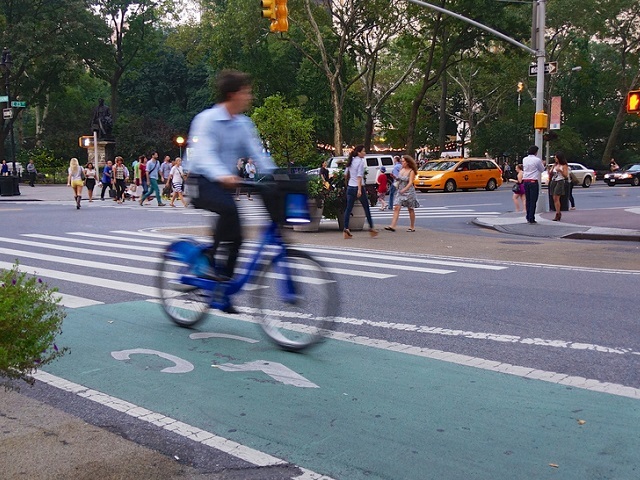 Safe, connected bike lanes in New York City fosters use of the city’s bike-share systems. Photo by Ted Eytan/Flickr. Peter Midgley joins us as the author of the Bike-share report series, exclusive to TheCityFix. We invited Peter to share his vast knowledge on bike-sharing gained through his experience tracking the growth of bike-sharing systems since 2007. Peter formerly worked as the Urban Mobility Theme Champion for the global Transport Knowledge Partnership (gTKP). The previous post in this series focused on lessons from the collapse of the Bixi system. How important are bike lanes to successful bike-sharing? Judging by some bike-share maps, not at all. Surprisingly, very few online maps that show the distribution of bike-share docking stations include bike lane networks. Safe bike lanes, and the knowledge of how those bike lanes connect together and in turn connect to other forms of transport, help to mainstream bike-sharing as a mode of transport and improve overall bike-sharing system performance. One recent study even points out a statistically significant relationship between the number of trips by bike-share and the supply of bike lanes. For this reason, integrating bike-share systems with networks of bike lanes is key to increasing ridership and making bike-share safe and desirable for users. Too many cities have bike lanes that go nowhere, end in unsafe conditions, or pass through dangerous intersections. Continuity and connectivity are key ingredients to attract users beyond the typical cycling aficionados and make cycling more viable and comfortable for the everyday commuter. A good example of this approach comes from China’s Xiamen Island, which is developing a 156 kilometer (95 mile) bike lane network as an integral part of launching its new bike-sharing system. The new system will boast a fleet of just over 11,000 bikes and 376 stations and is being developed with stations along six bike routes (1.5 to 2.5 meters/5 to 8 feet wide) that run parallel to existing sidewalks, so that the network of existing footpaths can complement and augment the bike-sharing network. The city is developing a comprehensive and continuous bike lane “network”, not just a collection of disjointed bike lanes. Ensuring users know how to navigate these connected systems is another key, which cities like Barcelona, Buenos Aires, Lyon, Melbourne, Tel Aviv, and Washington DC have honed in on. It’s not enough for bike lanes to be connected to one another and to bike-sharing systems, they also need to be connected safely. Over the past three years, New York City has installed 320 kilometers (200 miles) of bike lanes (bringing the total to an impressive 920 kilometers, or 570 miles). According to a recent study from Hunter College at the City University of New York, over 50% of cyclists in the city use these bike lanes. Even more noteworthy, the study reveals that these lanes are used by 70% of Citi Bike bike-share riders, revealing a “greater tendency to ride on more ‘secure’ street or avenue environments than their cycling counterparts”. This is especially the case with protected bike lanes, furthering echoing the need for safe cycling infrastructure to grow ridership. Although Transport for London wrote that bicycle “super-highways” can provide for “safer, faster and more direct journeys into the city”, a 2010 review of London’s bike-sharing system and cycle superhighways found that 60% of respondents did not feel safer using the cycle superhighways. A recent article in the Guardian called London’s cycle superhighways “inherently dangerous pieces of infrastructure … that induce cyclists to travel with a greater sense of safety than is warranted.” One of the main issues with the superhighways is lack of continuity, especially at junctions. Now, London is transforming its “cycle superhighways” into protected lanes following the deaths of three cyclists on Superhighway 2 in 2013. Other cities are moving in this same direction: according to an article in Momentum Mag, the number of protected bike lanes has doubled in North America in 2012. Smaller cities are also recognizing the importance of connectivity for bike-sharing system success and are working towards developing this infrastructure. PeopleForBikes, a nonprofit organization based in Boulder, Colorado, selected Pittsburgh and Boston as two of six new cities that will receive two years of financial, strategic and technical assistance to install protected bike lanes. In Pittsburgh, the first lane is scheduled to open in the fall of 2014 to coincide with the launch of the Pittsburgh bike-sharing program. In Boston, the grant will help speed up the installation of protected bike lanes that are already in the works. Many cities are new to realizing the importance of safe, connected cycling networks, and they need clear platforms for city leaders and planners to put this into action and implement cycling infrastructure. The Dutch Design plan, as well as the Cycling Embassy of Denmark’s publication “Collection of Cycle Concepts 2012,” both have detailed sections on planning and designing cycling infrastructure that can help designers to create connected bike networks. Also useful is NACTO’s (the United States National Association of City Transportation Officials) comprehensive online “Urban Bikeway Design Guide,” derived from best practices in cities around the world. Finally, Cycling-Inclusive Policy Development: A Handbook from GIZ contains a detailed chapter on designing bicycle networks. The combination of policy and proof of connectivity’s success should encourage cities around the globe to implement safe, connected bike lanes to improve bike-share and expand sustainable mobility.